Brogan looks around her spacious light-filled three bedroom home in the pretty coastal town of Forster, NSW and smiles remarking, ‘I’m very lucky’. But luck doesn’t come into it. It was Brogan’s hard work, patience and determination that saw her purchase her home last year and provide a secure future for herself and her young children. Brogan and her family happy in their new home. When Brogan first decided she wanted to buy her own home she didn’t have enough saved for a deposit but by getting in touch with IBA early, she had help to set her goals and make a plan. ‘I got in touch with IBA and spoke to Cathy,’ says Brogan. ‘She helped me sort out what my options were and how much I needed to save. It was really straightforward. Once Brogan got close to her savings goal, she got back in touch with IBA and soon had her loan approved to buy her home which she moved in to in July 2016. ‘I love the new home, it’s so good owning my own place,’ she says. ‘Even just to be able to put up a painting without asking permission and just to know I am not paying dead rent is really rewarding. 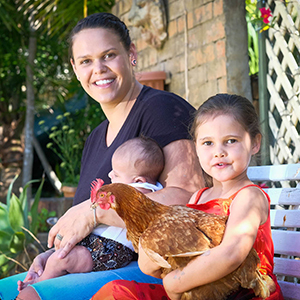 IBA home loans are targeted to Aboriginal and Torres Strait Islander first home buyers and have affordable interest rates, low deposit requirements, no mortgage insurance and a supportive application process. Cathy Post, Principal Home lending Officer at IBA says: ‘Being able to assist customers like Brogan is very rewarding and I am pleased she has achieved her home ownership dream. Find out more about IBA’s Home Loans.